My Grandparents used this cabinet for their dearest position the radio. Over the years my grandfather would take it out to his shop in the garage and slather another coat of shellac onto the cabinet and one year he decided to add plywood doors to it. Granddad liked his large screws as much as the shellac and bore big holes for the hinge screws. Love my Granddad he loved to tinker. 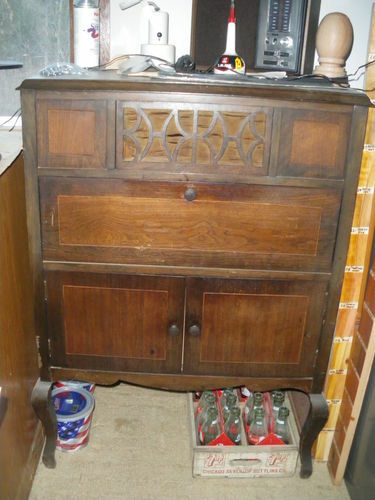 Over the years the cabinet got set aside in garages and basements pretty much neglected. One day I asked my mother if I could claim this old cabited and restore it. I could see what it once was through the blackened diry finish and plywood doors. I got the nod of approval and took it back to my shop. Like I said Grandpa loved his shellac, it took days of applying stripper and scrapping to get to the lovely wood. I decided to scrap the doors and feel in the screw holes. On close examination I noticed a 1/4” dado around the cabinet opening. The dado was only an 1/8” deep too small for my old hands to try and apply an inlay. I decided to play with my airbrush and paint the dado an “antique gold” color. I liked the results. Here it is all finished awaiting its new life in my home. For now I will use it as a night stand in our guest bedroom. I will keep my eye open for an period radio though. Another piece of our history saved from the burn pile. Thanks for looking! I am new at restoration, and surprisingly finding it fun to do. Great “wood rescue” and a great job too! You seem to have developed a knack for finding these “oldies” to work on and bring them back to their former glory. 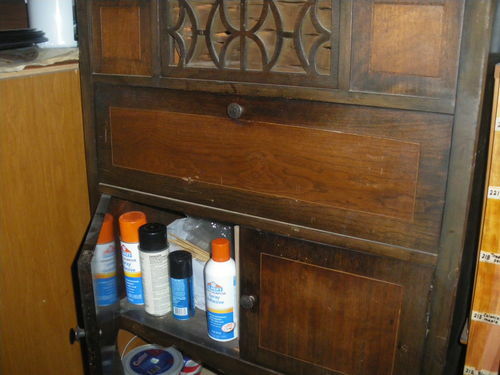 You have done a wonderful job on restoring this beautiful cabinet. Your restoration was certainly worthwhile. You did an excellent job. Here are some photos of a similar radio cabinet (original finish—needs restoring) that might give you an idea if you ever want to reconfigure it more to the original days. The radio fits into the middle section and is partially open above the radio. The top section has fabric (which needs replacing) in the center portion to allow the sound to come out. It resides in our shop and holds odds and ends of supplies. 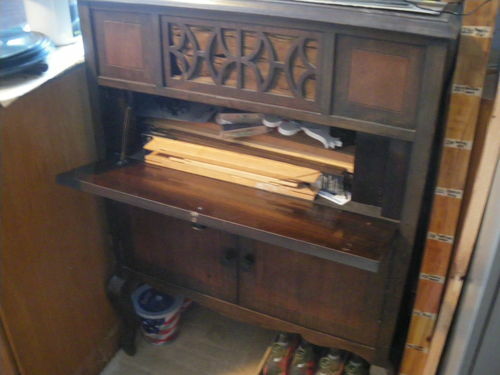 This cabinet was certainly worth saving! You’ve got a great start on it, and I’d love to see it with the radio, once you’ve got it installed! Nice work Kelly. It is wonderful to see old pieces like this restored. I bought a very good book about furniture restoration many years ago written by a very capable English restorer. It is a fascinating book and the work shown in it would be worthwhile challenge for any woodworker. I continue to read it off and on and I have been able to fix many of my own mistakes quite well using some of the techniques I learned from it. You did a great job—no question. But that is actually a great design. Glad you took the time to save it.